Maximizing cooperative advertising resources so they actually lead to measurable consumer-dealer sales is, to me, the Holy Grail in business. Imagine, then, discovering Dealer Ignition, an organization delivering the next best thing! 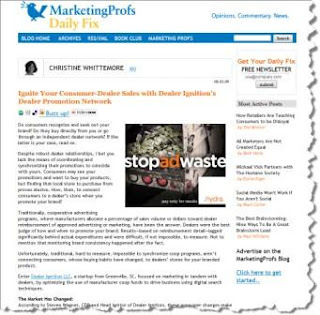 What I learned is the subject of my latest MarketingProfs Daily Fix article. It's titled Ignite Your Consumer-Dealer Sales with Dealer Ignition's Dealer Promotion Network. In my previous life at Solutia, both with Wear-Dated upholstery fabrics and Wear-Dated carpet fiber, cooperative advertising support played an important role in motivating retailers to support our brand. As effective as coop was, it wasn't perfect: we could suggest when to run a promotion, but the dealer ultimately made the decision. Measurement, analysis and improvement were near impossible [I remember sifting through mounds of spreadsheets trying to glean actionable purchase patterns and insights]. And, corrections couldn't be implemented until the next promotion -- and even then success was limited. Do you remember how those bad logo files managed to stay in the system for what seemed like forever? Change, though, is in the air. Dealer Ignition, based in Greenville, SC, has developed a robust framework - a Dealer Promotion Network - for digitally connecting a brand with its dealers. The connection means that brand promotions can be seamlessly distributed and uploaded to individual dealer websites. It includes analytics for intelligent tweaking, testing and improvement, and it connects consumers searching online with the right information so they can purchase that branded product in a local store. For the record, I have no relationship with Dealer Ignition other than having had a fascinating discussion with Steven Wagner, CEO and Chief Ignitor, being delighted that my friend Connie was featured in the testimonial video, and generally admiring a practical and elegant solution to a marketing tool that we always considered a necessary evil because we were never able to measure it, improve it or deploy it in an integrated and coordinated fashion. Would you let me know what you think?